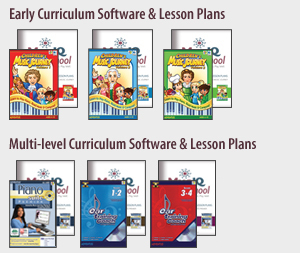 The MusIQ HomeSchool multi-level curriculum was developed by experienced music educators and leaders in piano pedagogy. The program utilizes sophisticated software acclaimed by thousands of professional instructors and students around the globe. The core of program, Piano Suite, is characterized by it’s advanced learning engine, careful methodology and a massive library of learning repertoire with enough content for a student to make excellent progress in music theory, playing skills, composition and music history. Repertoire • 5-Finger position melodies, Some hands together playing.